Interview from the archives with Vermont poet David Budbill. Subsequent to this conversation, David Budbill's Park Songs: A Poem/Play came out from Exterminating Angel Press in September 2012. A new book is expected next month. Perhaps he'll agree to come back on the show to talk about it. Today's Write the Book Prompt is to allow an object to bring you into a setting. Imagine an object. For example, a bottle of lotion. Where is it sitting? Is it on a windowsill? Is that the kitchen windowsill? Does the person who lives in this house have the habit of rubbing lotion on her hands after she does the dishes? What is the rest of her kitchen like? And on and on. Begin with an object, focus on that to begin. Describe it. Pull back. What's next to it? And next to that? What colors are in the place? What furniture? Is there a trash can? Allow the first object to give way to others and, eventually, let yourself imagine an entire setting. Interview from the archives with Wendy Call, writer, editor, translator and teacher. Author of No Word for Welcome: The Mexican Village Faces the Global Economy. In fact, this week's live broadcast was with Vermont author Tammy Flanders Hetrick. But due to a strange set of circumstances, her podcast has been up for a couple weeks already. You can find it here. Public shaming has been in the news a lot lately. Even before the internet, shame and disgrace could be widespread and malignant. Just read The Scarlet Letter. This week's Write the Book Prompt is to write about a person who has been disgraced. Consider the reason for the disgrace. Has this person done something truly despicable? Or did he or she simply get caught looking foolish? Is the shaming mean-spirited, or does it come from a supposedly kind place. That "tough love" philosophy, for example. Does it get out of hand? How? Why? Why do crowds like a good public shaming? Are there larger lessons that can be conveyed subtly by writing about a person in this situation? Write the Book's 351st episode (!) introduces Shelagh's new co-host, Gary Lee Miller, in an interview with Vermont author Sean Prentiss about his new book, Finding Abbey: The Search for Edward Abbey and His Hidden Desert Grave, published by University of New Mexico Press. Find a piece of writing you love. Study it. What is the tone? What is the shape on the page? What is the title? How much dialogue is used? How are characters developed? What is the theme? Once you’ve studied the piece, then try to emulate it. Write your own piece that mirrors or learns from the piece you love. Allow yourself to follow the original, but also to meander where you need. The second prompt for this week focuses on beginning and endings. If you have a draft of an essay, story or poem that you like but find yourself stuck with the beginning or ending, go ahead and add a second beginning or ending. Just tack it right on. Maybe start or end your piece with an overt idea, or start or end your piece with a scene that moves us to some new place or time. Or start with a powerful metaphoric image. This can be just the kind of writing play you need to get you where you want to go. Music credits: I Could Write a Book by the Boston-based band, Possum. 2011 interview from the archives with Seattle-based writer and teacher Priscilla Long. We discussed her wonderful book and writing resource, The Writer's Portable Mentor. This week's Write the Book Prompt is to consider the word mentor. Have you ever had a mentor? Have you ever been a mentor to someone else? What have those relationships provided for you and the other person? Are you still in touch? Is the coaching/education/guidance ongoing, or was the mentorship a temporary situation? If you're no longer in touch, do you miss that other person? If you were the mentor, what did you get out of offering guidance to another? Consider all of these questions, and write. 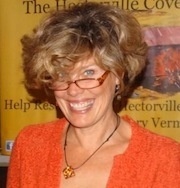 Vermont author Tammy Flanders Hetrick, whose new novel, Stella Rose, was published in April from She Writes Press. This week’s Write The Book Prompt was suggested by my guest, Tammy Flanders Hetrick. It’s essentially the idea that prompted her to write her novel, Stella Rose. Imagine knowing that you weren’t going to be there. Imagine having three months to prepare. Now write.